Net Promoter Score (NPS) has been a hot topic ever since it was developed 15 years ago. Depending on what side of the fence you’re on, you might or might not hold a lot of value in the metric. Recently I participated with some of my customer experience colleagues in a blog post discussion of whether we would recommend the score. The feeling was mixed. Based on the luke-warm reaction to it, can we use NPS to drive corporate growth? The big issue is we expect NPS, alone, to do too much. 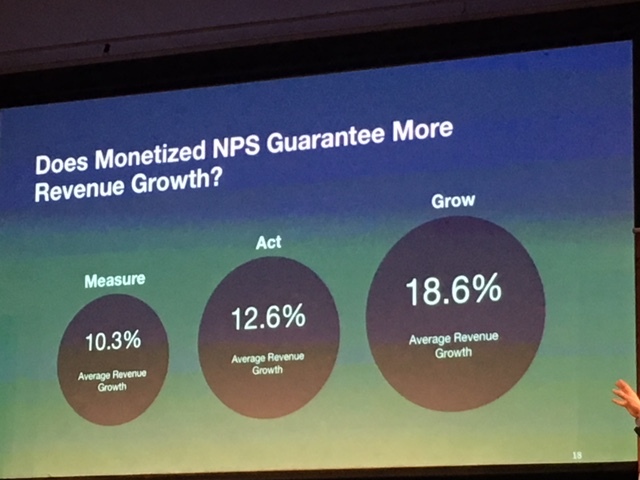 When it doesn’t deliver, we chalk it up to NPS being a bogus metric. 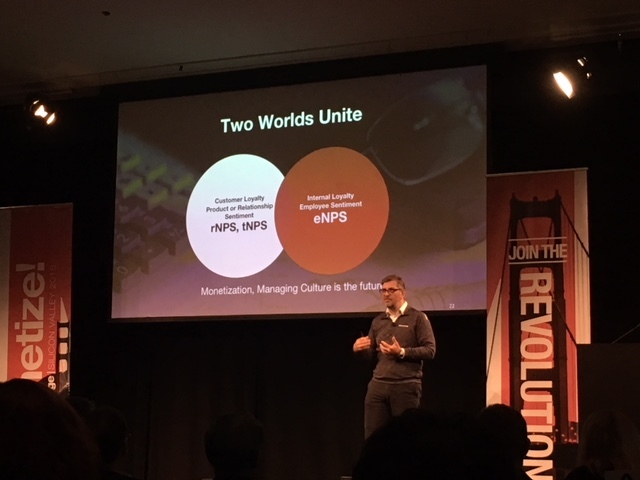 Of course, NPS should not be used as an absolute metric, which is why it should be taken as a piece of the metrics pie. And the goal shouldn’t be the number, but how to use it to improve customer experience. 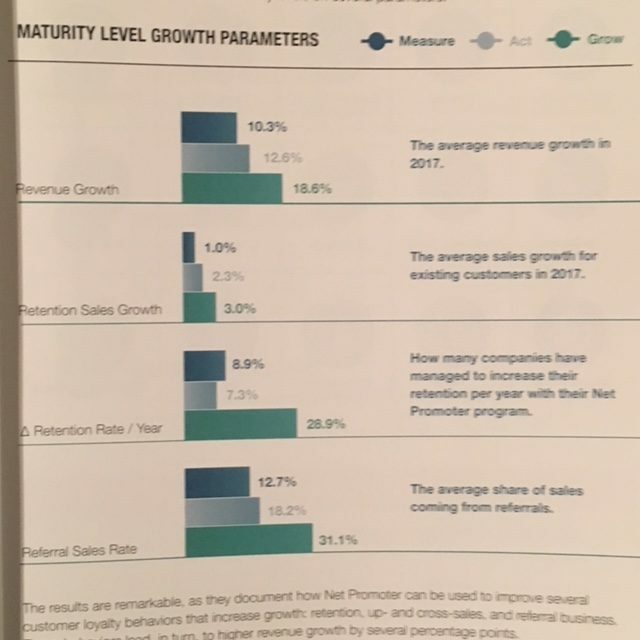 I believe we can use NPS to drive corporate growth. Know why you’re measuring NPS. Focus in on the goals of your customer experience. Begin with the end in mind. What bottom-line revenue outcomes do you want? What activities will you engage in to produce the results to generate those outcomes? Figure out the part NPS plays in this. Combine NPS with other metrics. NPS is part of your total metrics mix. Looking at the metrics in the aggregate is a necessary step to get a true picture of your customer experience. Then, you have to go behind the numbers to understand what the numbers mean so you know the corrective action(s) to take to fix. Make NPS relational, not transactional. NPS is a relational metric, meaning it covers the entire relationship you have with your customer. However, some companies choose to use it as a transactional metric and administer the NPS survey after each customer service interaction. This is the wrong approach. It can set up a lot of false positives that customer health is really something that it is not. Ask 3 questions rather than one. Ask the NPS question: on a scale of 0-10, how likely are you to recommend this brand/product/service to a friend or colleague? Then, ask why did you give the score you gave? Then, ask what thing(s) can we be doing better? I’m very interested in NPS and metrics, in general. To that, I’ve been intrigued with CustomerGauge, headquartered in Amsterdam, The Netherlands. CustomerGauge is a platform that helps SaaS companies improve and monetize the customer experience. The system automatically measures and analyzes feedback, reduces churn through close-loop tools, and helps retain customers using the industry-standard metric NPS. Results are published and analyzed in real-time, using a highly customizable reporting tool, making it ideal for global enterprises. Last week, I attended its event, Monetize!, in Mountain View. 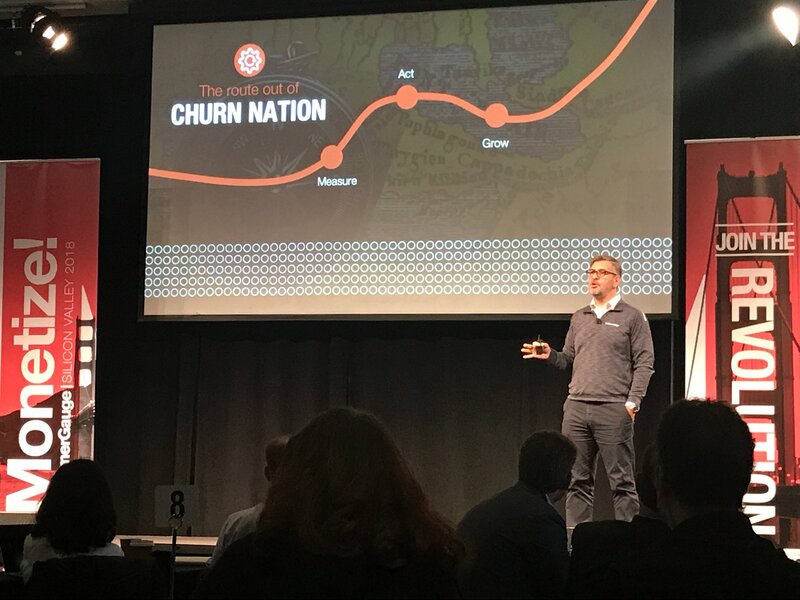 The day started out with CustomerGauge Co-Founder/CEO Adam Dorrell discussing the route out of churn. He calls it Measure-Act-Grow. In the Measure phase, you run frequent and short relationship surveys, and analyze NPS drivers and root causes. Many companies stop here and wonder why NPS “doesn’t work”. Companies have to go through the entire journey. The Act phase is where you close the loop with your customers, especially passives and detractors. This is also where you set and manage NPS targets. The Grow phase is where you link NPS with revenue elements like retention, referral marketing, and up-/cross-sales. But what’s most important is combining customer sentiment, product sentiment with employee sentiment. I personally view culture, employee experience, and customer experience as the holy trinity. The three aligned and working together is the key to success and growth. 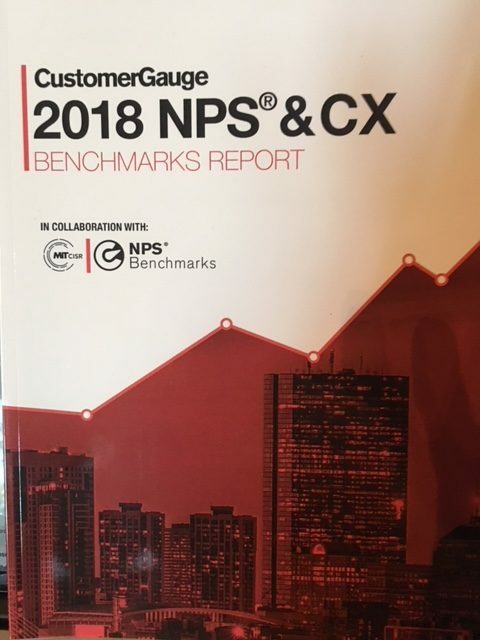 Jørgen Bo Christensen, VP Research and Professional Services, discussed CustomerGauge’s 2018 NPS & CX Benchmarks Report. The purpose of the report is to (1) measure the state of NPS, (2) identify NPS best practices, and (3) examine how NPS impacts growth. The study actually began in 2016. 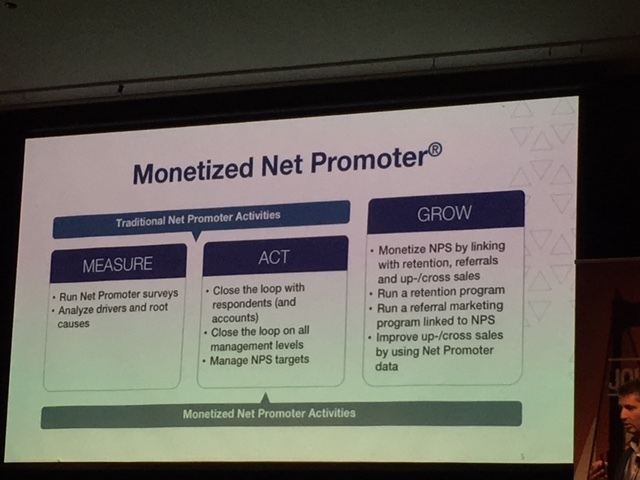 As a result of it, CustomerGauge established the Monetized Net Promoter model, which divided NPS best practices into four maturity levels – Measure, Act, Monetize, and Grow. It morphed to three levels (Measure-Act-Grow) to better resonate with C-suite audiences. Christensen gave attendees some data points. Roughly 50% of companies use NPS to improve customer experience. 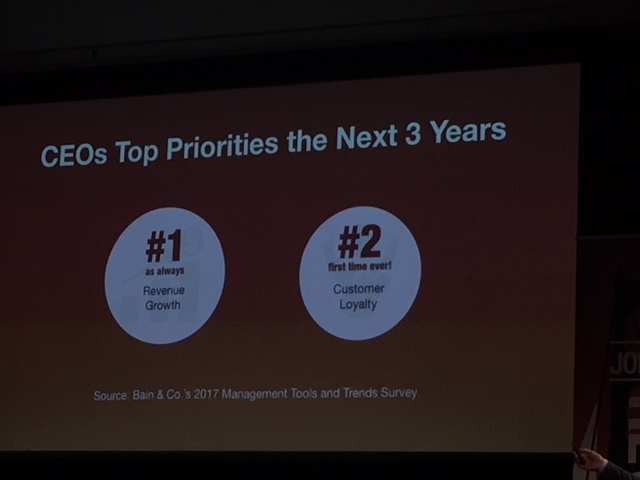 The #1 priority of CEOs over the next three years is Revenue Growth! 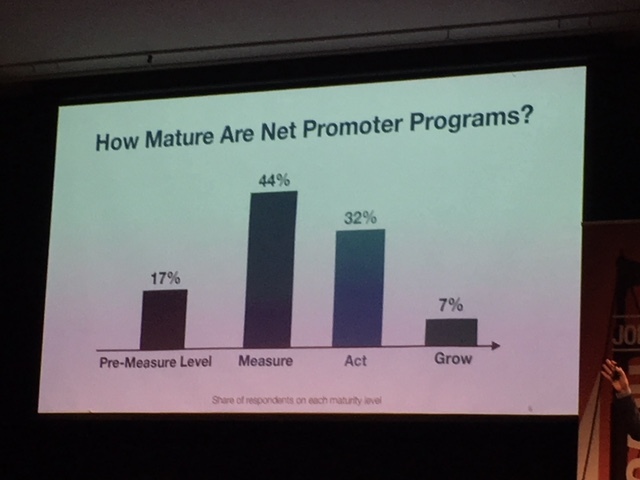 Yet, many companies only use NPS as a measurement tool. They aren’t using it to determine how/where to improve the customer experience. This explains why many companies are failing. Christensen said that when companies use the Measure-Act-Grow model, SaaS organizations grow faster. 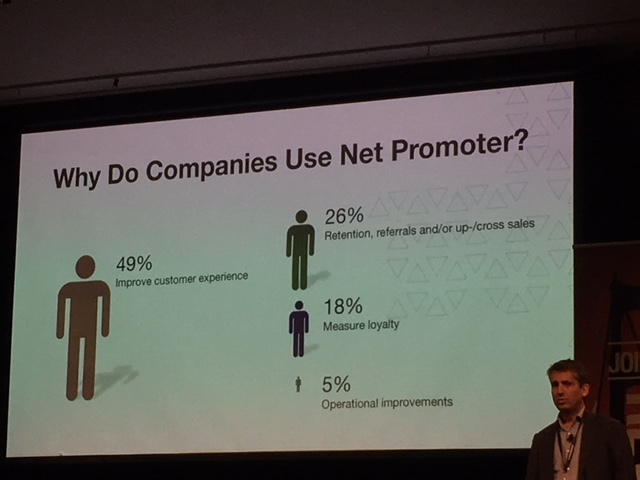 He showed attendees how NPS can be used to improve several customer loyalty behaviors that increase growth: retention, up-/cross-sales, and referrals. These behaviors lead to higher revenue growth by several percentage points. Then, Christensen discussed key best practices at each level. -Conduct short and frequent (4 x per year) surveys. -Supplement relational (NPS) surveys with transactional (such as CSAT or CES) ones. -Digitalize your surveys. Email is still the most popular survey channel. -Perform root cause analysis to understand what is behind the score so you know how to improve it. –Close the loop at the front line, with management, and with executive management. Doing so helps companies rescue detractors and passives from churning and may mobilize promoters. -Close the loop with the customer within 48 hours. -Set targets for relevant KPIs. This includes NPS, response rate (share of surveys answered), and coverage (share of customers providing feedback). Doing so will increase retention, reduce churn, and ultimately improve your NPS. Christensen noted that companies that don’t close the loop will experience churn and lose two NPS points per year. -Measure retention/churn and link to NPS. -Carry out rescue actions based on value and churn likelihood. -Measure up-/cross-sales and link to NPS. -Target sales campaigns towards promoters and passives. -Measure referral impact on sales. -Establish a referral marketing program and incentivize promoters to become customer advocates. 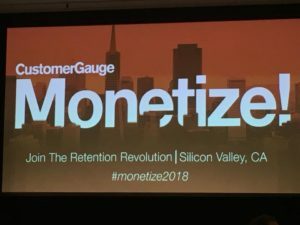 Christensen shared that while it’s 5 to 25x more expensive to attract a new customer than to retain one, one out of three companies still doesn’t know their retention rates. Christiansen said that the best companies report retention rates above 95%. 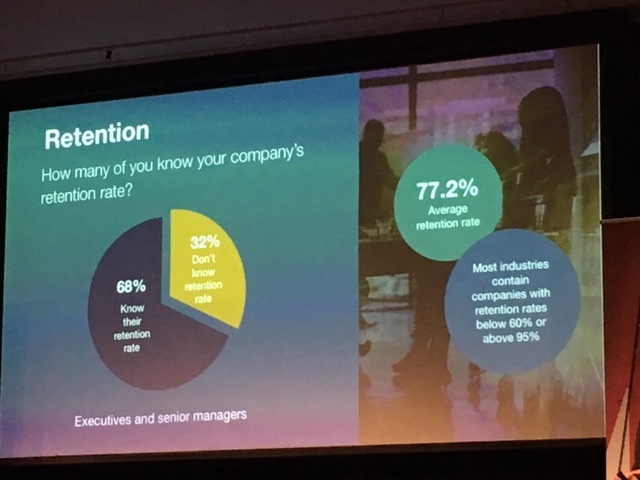 But, many industries contain companies with retention rates below 50%, meaning there is still room for retention revenue growth. That said, for NPS to have value, you have to take steps like CustomerGauge suggests. Measure NPS so you know where you are and what’s behind the number. And value it as part of your overall metrics mix. This gives you a barometer of where you are customer experience-wise. Then, act on the feedback. Close the loop with the customer quickly. And, create goals and targets which help increase retention and reduce churn. Then link NPS to revenue, retention, referral sales and up-/cross-sales. Performing all three together will help you use NPS to drive corporate growth!